Every argument in favour of airport expansion has been exposed as a con, so why are we still talking about it? We don’t want to see any new runways across the South East. This is – and has always been – the Green Party’s position on airport expansion. Whilst we are clear and honest about our position, the positions of the three traditional parties are, to say the least, ambiguous. After many a U-turn, our prime minister has let all parties off the hook by allowing them to avoid taking up a position on expansion until after the General Election. When David Cameron set up the Davies Commission in 2012, there was a rising crescendo of business pressure for new runways. Cameron effectively kicked the issue into touch until after the 2015 General Election, ostensibly with a brief to Sir Howard Davies to consider whether expansion in the South East was necessary. Since then, the huge budgets of the pro-expansion lobby have been busy trying to convince people that expansion is our only choice. It’s a con that has thankfully been exposed by the Sunday Times over the weekend. However, the reality now is that every debate begins by asking where expansion should take place, when the real question which needs to be asked is whether it should take place. For the Greens, major airport expansion, such as adding a new runway into the mix, doesn’t add up. Nothing has changed since 2009/10 when Labour lost the arguments to build a third runway at Heathrow. Britain is already amongst the most frequent flyers in the world and contrary to public opinion, does not have a capacity crisis. I repeat, does not have a capacity crisis. 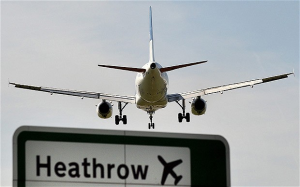 Excluding Heathrow, every other airport across the UK, including Gatwick, is underused. Furthermore, nine of the ten most popular destinations from Heathrow are short haul flights. Existing rail services could offer workable alternatives on most of these routes, thus freeing up landing slots for longer haul flights. As trains are ten times less polluting than planes, this would also be better for the environment. Sadly, the climate change arguments also seem to have been lost. When I wrote to Sir Howard Davies last month to argue that government policies on climate change and airport expansion are mutually incompatible, I was disappointed to hear in response that he thinks “additional capacity can be provided in the UK while meeting the climate change targets”. This would only be feasible if all airport growth – across the entire country – is completely halted, which is never going to happen. Recent analysis by the Aviation Environment Federation (AEF) found that if you added a new runway to the South East, even if you then constrained all regional airports to today’s level of flying, you’d still overshoot the emissions limit by 2050. It’s simply untrue to suggest that we are losing business to other countries because of our decision not to build new runways. More passengers fly in and out of London than any other city in the world. Additionally, the employment benefits of expansion have been overplayed. Claims that airport expansion will create thousands of new jobs to help the country through the recession are based on unreliable statistics. Furthermore, expansion actually results in more UK tourists going abroad, which creates a ‘tourism deficit’. What’s more, the aviation industry can’t even stand on its own two feet! At present, as I found out in detail at a ‘Taming Aviation’ event I hosted in the European Parliament last month, the aviation sector receives an enormous amount of direct and indirect subsidies from European taxpayers. While every European consumer, small business and haulier has to pay, on average, a tax of 48 eurocents per litre of fuel whenever they fill up their vehicles, commercial airlines based in the EU and flying into the EU don’t pay a single penny of tax on their fuel. Shockingly, aviation’s state aid and exemptions from fuel tax and VAT amount to €43bn every year. This all begs the question of who expansion is even benefiting. In the UK, 15 per cent of the population take 70 per cent of the flights. To generalise, these are taken by more affluent people who can afford to fly regularly, not one-off holidaymakers. In 2013, 55 per cent of the population took no flights. After the Sunday Times revelations, we must start to question the need for expansion again. This entry was posted on December 8, 2014 at 7:09 pm and is filed under Uncategorized. You can follow any responses to this entry through the RSS 2.0 feed. You can leave a response, or trackback from your own site.